I can’t believe I made it through my first “year” as an empty nester. I’m off to pick up my “bigger” girl from college. Now to learn how to deal with a teen who is used to not having a curfew anymore. Any tips are most welcome. Last month I wrote about a client who took my home staging advice and sold in less than a week with 4 offers at $70,000 over asking. A couple of weeks later I was invited to apply for a host spot for a new HGTV show and my home staging client helped me shoot my demo video for it. I don’t know whether I’ll get the host spot but I was thrilled when the casting director said my submission was “right on the money.” Now it goes up the chain of command and we’ll see what happens. Keeping my fingers crossed! Have you heard about the 4 latest home staging jobs? They’re in North Carolina, Massachusetts and California. If you’re not getting job notifications, subscribe to Home Staging Business Report by filling in the big box on the home page. I recently wrote about whether you’re stuck with your home staging business name if you decide you don’t like it, and what to do if you started with a sole proprietorship and want to switch. If you missed the story on my blog, check it out and see the comments from fellow stagers. In this month’s articles I share the staging of 2 model homes, the fastest and easiest way to get unstuck and open up the question of whether you need a professional photographer or you can DIY for your portfolio. You’ll also meet 4 inspiring home stagers. To read this month’s home staging articles Click Here. 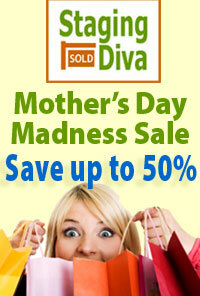 And don’t forget to check out our Mother’s Day Madness Event going on right now with savings of up to 50%. 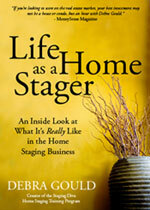 Visit http://www.stagingdiva.com/store/.